Assuming her responsibilities as the Gilbert S. Kahn Dean of Veterinary Medicine in 2006, Dean Hendricks believes that veterinarians play an integral part in ensuring public health and food safety, guarding against bio- and agro-terrorism and working to protect the environment. She has played a lead role in lobbying to state legislators on behalf of the School. This broad view of the impact of veterinarians in society is encompassed by the One Health Initiative.? ?Before taking on the role as Dean, Dr. Hendricks served as a faculty member for Penn Vet for more than 20 years. In her role as a faculty member, Dean Hendricks became the first woman to hold an endowed professorship at the School when she was named the Henry and Corinne R. Bower Professor of Small Animal Medicine in 2001. She has also served as chief of critical care in the Department of Clinical Studies at Philadelphia and is founding director of the Veterinary Clinical Investigation Center (VCIC). Dean Hendricks holds a secondary appointment as professor in the Department of Medicine at Penn’s School of Medicine and has served in a leadership position in the Pennsylvania Veterinary Medical Association (PVMA). Dean Hendricks’ work has been widely published in peer-reviewed journals, including the Journal of the American Veterinary Medical Association (JAVMA) and the Journal of Applied Physiology, and she is frequently invited to lecture at major conferences around the world. During her sabbatical year, she investigated how molecular biology could be applied to neuroscience, specifically to the field of sleep and sleep disorders, in which Dean Hendricks is a recognized expert. She has studied bulldogs extensively and published pioneering studies on the molecular biology of sleep in fruit flies in the high-impact journals Nature Neuroscience and Neuron. 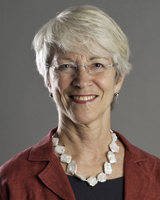 In 1979 and 1980, Dean Hendricks earned her VMD and PhD from the School, respectively. She also carried out her residency and postdoctoral fellowship at Penn. She has a bachelor of science in biology and psychology from Yale University. Behavioral, gene expression profiling, and biochemical assays to characterize correlates of states of arousal in Drosophila; mutagenesis to identify genes involved in sleep-like rest homeostasis; drug testing and mutagenesis for novel mechanisms of wake promotion. After decades of studying physiology and anatomy of sleep and an animal model of sleep apnea (the English bulldog), I have turned my attention to a simpler model-Drosophila. I showed, using behavioral, pharmacological, and molecular approaches, that Drosophila's rest state has sleep-like properties. We have since used this model organism to show that the cAMP-PKA-CREB signaling pathway is involved in rest regulation as well as its well-known role in Long-Term Memory consolidation. This role is conserved in mice. The research program is rapidly expanding to use the Drosophila model to discover genes involved in rest homeostasis using comprehensive mutagenesis as well as the candidate gene approach. We are also collaborating with other researchers in the Center for Sleep and Respiratory Neurobiology to characterize the biochemical profile of rest and waking in flies. We are also using wake-promoting drugs whose mechanism is poorly understood as a probe to identify the genetic basis of rest and waking in flies. Williams JA., Sathyanarayanan S., Hendricks JC., Sehgal A. Interaction between sleep and the immune response in Drosophila: a role for the NFkappaB relish Sleep 30: 389-400, 2007. Koh K., Evans JM., Hendricks JC., Sehgal A. A Drosophila model for age-associated changes in sleep:wake cycles. [see comment] Proceedings of the National Academy of Sciences of the United States of America 103: 13843-7, 2006. Hendricks JC. Broadening the public perception of veterinarians: can we keep what we've got while transforming ourselves? Journal of Veterinary Medical Education 33: 593-4, 2006. Hendricks JC. Shaking up sleep research Nature Neuroscience 8: 703-5, 2005. Hendricks JC. Mining the mouse mutant goldmine for sleep phenotypes. [comment] Sleep 28: 389-91, 2005. Hendricks JC., Sehgal A. Why a fly? Using Drosophila to understand the genetics of circadian rhythms and sleep Sleep 27: 334-42, 2004. Hendricks JC. Invited review: Sleeping flies don't lie: the use of Drosophila melanogaster to study sleep and circadian rhythms. [Review] [170 refs] Journal of Applied Physiology 94: 1660-72; discussion 1673, 2003. Hendricks JC., Kirk D., Panckeri K., Miller MS., Pack AI. Modafinil maintains waking in the fruit fly drosophila melanogaster Sleep 26: 139-46, 2003. Hendricks JC., Lu S., Kume K., Yin JC., Yang Z., Sehgal A. Gender dimorphism in the role of cycle (BMAL1) in rest, rest regulation, and longevity in Drosophila melanogaster Journal of Biological Rhythms 18: 12-25, 2003.